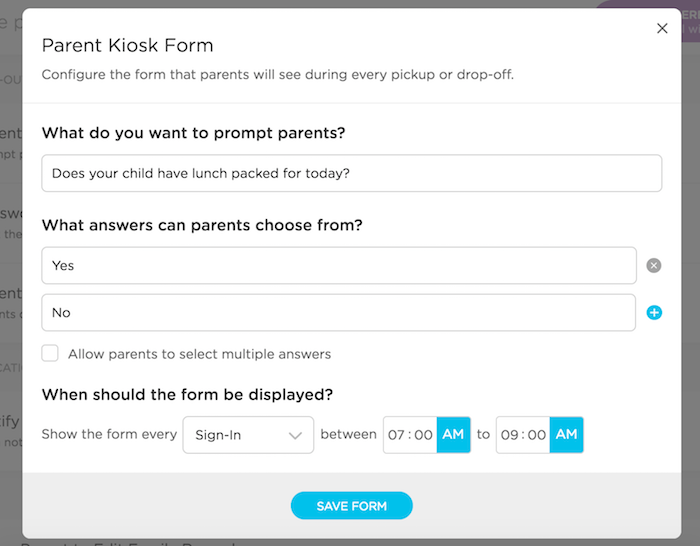 If you have a prompt for parents that needs to be answered every day during Sign-In OR Sign-Out, the Kiosk Form is a great tool. If you have a prompt that needs to be answered DAILY by the parents during Sign-In OR Sign-Out, review the steps below. Go to School Settings > Settings and click on the "Enable Form" button to begin setting up your Kiosk Form. You'll see a pop-up with fields for entering your prompt, possible answer choices for the parents, and the time frame for when the prompt should appear. You will be able to add up to 8 answer choices, and you can allow parents to select multiple answers or only one. NOTE: At this time, you can only create one question total. However, by going back to the Settings page and clicking on the "Enabled" button, you are able to edit the question if necessary. Parents will follow the usual steps on the Parent Kiosk. However, after pressing the button for "Sign In" (or "Sign Out"), the Kiosk Form will appear. 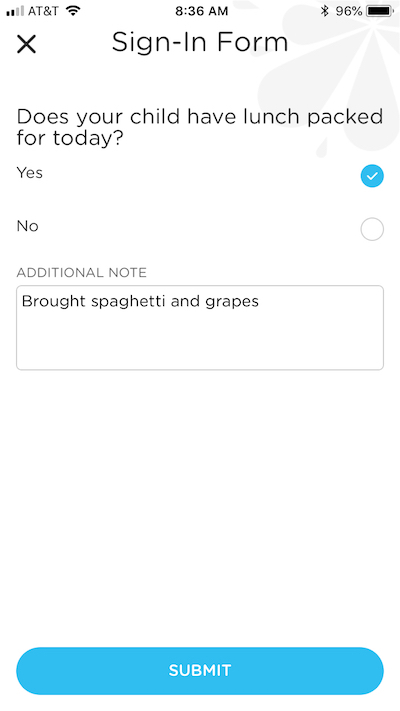 They will then be able to select their answer(s) and add an additional note if necessary. After submitting the form, the parents will then record their signature (if parent signatures are enabled) and the screen will return to the Parent Kiosk for the next parent. Go to Sign In-Out > Student Attendance. As you look at the table with students' in/out times, you'll see a little note icon toward the righthand side. If you hover over the icon, you'll see how the parent answered your kiosk question. Go to Reports and generate a Daily Attendance report. You'll be able to view the Kiosk Form answers on both the .xls and .pdf versions of the report.